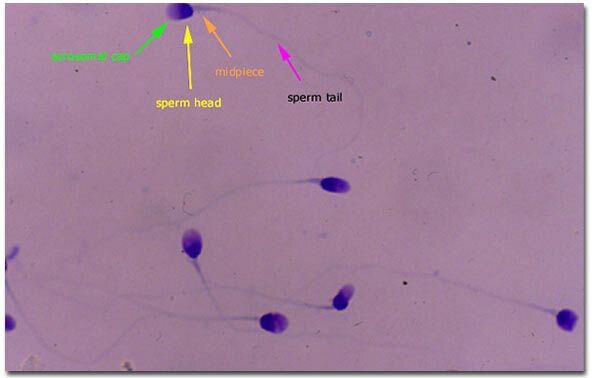 Photomicrograph (microscopic view) of sperm that has been stained with a modified Wright-Giemsa stain. The percentage of “normal forms” that is reported depends on the morphology criteria that is selected. Using the World Health Organization criteria (WHO 2nd edition) the percentage of normal forms for this (entire) sample is 81% whereas when Strict Morphology criteria are used the percentage of normal forms for this (entire) sample is only 15%.